R10000-MF is rated 4.7 out of 5 by 162. Rated 5 out of 5 by Sabretooth from Delta Makes a Good Quality Valve Body This valve body is solidly constructed. It is also very innovatively and logically designed. Rated 5 out of 5 by Nan from Valve Upgrade This new rough-in valve gave us the flexibility to install a shower handle with temperature control independent of the water volume. Went it easily and works great. Best of all, if access to the cartridge is needed in the future, it can easily be done by just removing the handle and not cutting into the wall! Easy to order, great price and excellent delivery time. Rated 5 out of 5 by Mike from Excellent support of the product line Warranty is the best in the business. Rated 4 out of 5 by Robin from Works as expected Not much to say. How do you review a rough in valve? It arrived as advertised, was installed by a professional plumber, and so far is functioning properly. I hope that remains the case as it is now buried behind expensive tile. Rated 5 out of 5 by JOHN1415 from So far, so good Our contractor installed this valve in our new bathroom. We purchased the one with "service stops" because we were told these "stops" allowed you to turn off the water here and not have to turn water off to the whole house. It seems to work because our shower works fine. Obviously, I'm not a contractor and had no clue what this was for, but our contractor indicated it worked fine, too. I'm not sure how much these cost at retail and I can't speak about the quality other than our experience. It seems to do the job it's supposed to. What is the difference between this model with PEX Cold Expansion R10000-MF and the PEX Crimp R10000-PX? Is the insert barb bigger in the former than the latter to accommodate the stretched PEX during installation? Thanks. What is the difference between a &quot;box&quot; model and the other roughin valves? Also, what is the difference between a high flow model and non high flow rough in showervalve? What size PEX pipe is needed for the R10000-PXWS inlet connections? For the MULTICHOICE&reg; UNIVERSAL ROUGH VALVE BODY - R10000-PXWS What size PEX pipe is needed for the inlet connections? Not completely understanding the different pex type of barb fittings, would the R1000-MF or the R1000-PX be the correct choice if my plumbing contractor uses Upinor Propex fittings for his installations? Is there a tech. sheet for fitting profiles? What is the flow rate of the R10000-MFWS as compared to the R10000-UNWSHF? I am planning a complete remodeling of a bathroom. Please advise on the differences between the two Universal and Shower Valve Body. Hi Reggie, In the abbreviation on the R10000-UNBX the UN stands for Universal connections on Inlets/outlets, BX is a single box model. The abbreviation in the R10000-IPWS the IP stands for iron pipe inlet/outlets and the ws means the rough valve comes with stops. 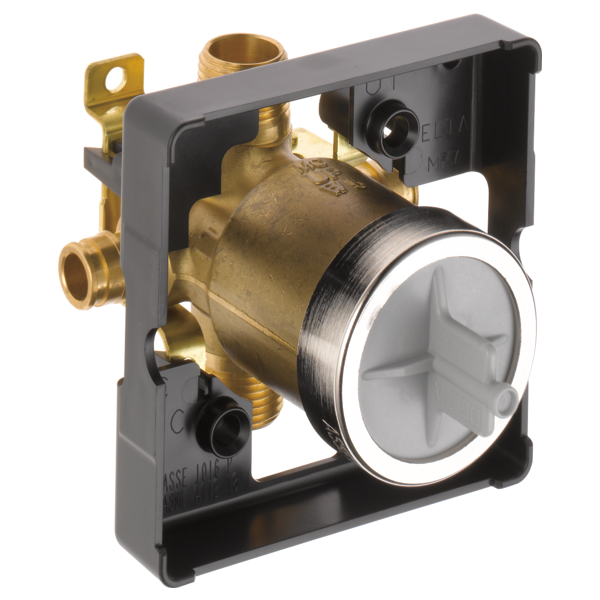 This allows you to turn off the water flow right at the valve vs. turning of the water to the home.